1. Everyone is in the workshop, everyone has a project. The food is coming in nicely — our next winter shouldn’t be a problem. I imagine that this small colony is buzzing with energy. There are hardships and disagreements, sure, but this will be okay. I can see a solid arc of survival ahead of us. No one dies in this colony. I get bored. I leave them in that moment, making clothes and planting seeds, in the sunlight, forever. 2. It’s another in a long line of raids. This one is hard on us—we haven’t prepared anywhere enough for a raid of this size. We have no turrets and no traps, no armor, not enough guns. And they have grenades. 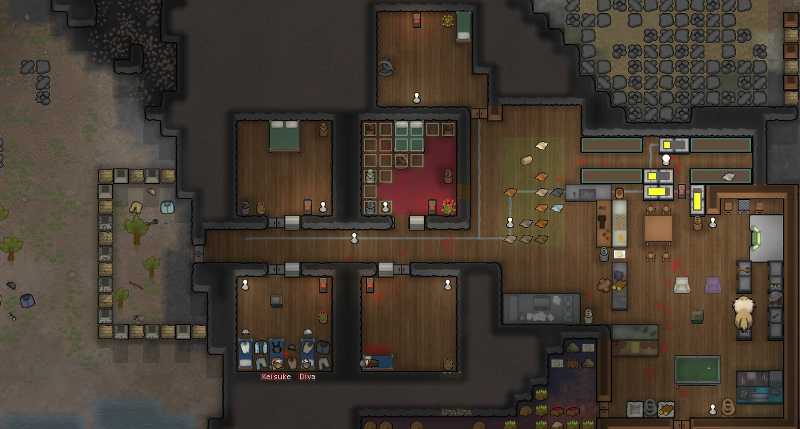 Four out of six colonists are in bed with serious injuries, including our doctor. Infection ravages us all. The first two to go are new recruits, mourned but not missed too intensely. The next to go is The Beauty, married to a man whose personality quirks means he misses her, but isn’t too fussed about it. But next is our doctor, and this breaks her husband. He beats the Beauty’s husband to death in the common area. I make a permanent save and start over. 3. I’m digging into a mountain and the ceiling collapses, killing a miner named Earth. Her dog snaps, turning into a manhunter, and I load a previous save. I don’t want to see things end like this, this time. I know winter will be hard, but I want to at least make it there. By the time winter has ended, we have eaten both of Earth’s dogs.